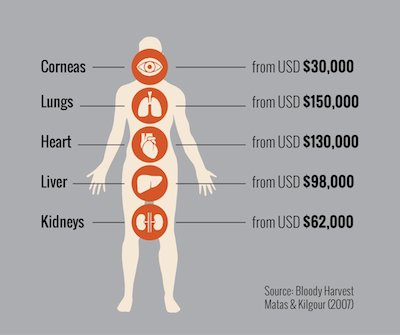 Though Organ Harvesting & Trading is a huge black market in many parts of the world, China is the only government in the world that takes an active part in the business. China has labour camps for it’s prisoners, and every so often, a busload of them will disappear unexplainably. It is part of Chinese culture that the body must remain intact after death. Because of this, China has no active Organ Donation program. Suspicious, since China has the shortest waiting times in the world for the transplantation of a new organ. In 2005, Chinese officials reported that 95% of the organs they transplanted were sourced from prisoners. Simple - China has been persecuting, torturing, and imprisoning citizens that practice the religion of ‘Falun Gong’ for many years, and they have many thousands of prisoners. This massive source of prisoners is just there, in the labour camps. The Chinese government knows how valuable organs are, so they have chosen to start the practice - a trade worth many thousands of dollars. These financial benefits aren’t just sought after by China however; there is a massive Black Market trade in many countries around the world, such as India and the U.S.
As with everything else, this has many pros and cons. Obviously this is at least a little worse than Capital Punishment, and carries with it all of the same cons. However, it has a lot of potential benefits as well. Of course, all of this assumes that Organ Transplatation is both allowed and accepted. The idea of this wouldn’t exist otherwise. This seems bad, but besides the methods these countries go with to be able to harvest the organs, the concept itself isn’t that bad. It makes some good out of what Death Row is already (criminal is executed, and their death helps those that are in critical need of new organs), and makes law enforcement easier (at least marginally). Should Organ Transplantation be allowed? Seeing as this is an extension of it, should Capital punishment be practiced? Should this be allowed at all? Even if it is more properly regulated and is made widely known what will happen to those who commit heinous crimes?